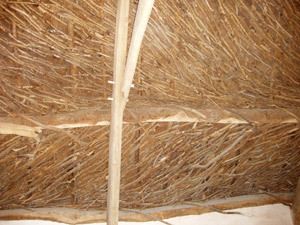 Thatching Conservation - History and Information on old thatched roofs. 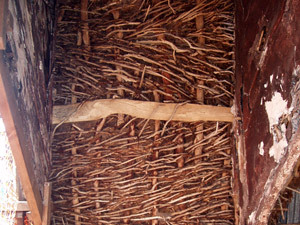 There is sadly but a handful of traditionally thatched roofs left in south Wales, the rest having had all of their rich heritage of historic thatch and basecoats so valuable to historians, botanists, archaeologists and the like systematically stripped to the rafters and destroyed to be replaced by imported water reed with disregard for our own culture, styles, techniques, materials, heritage and tradition. Block patterned ridges have appeared - unheard of until introduced by the Victorians, with all the subsequent socio history in farming, craftsmanship and supply forgotten’ the traditional simple looking but exquisite roofs gone forever( our ancestors would turn in there grave’s!). "With education I often find thatched home owners take the heritage view but as a Thatcher I find I am in a minority so I could always do with support!" Alan Jones - Master thatcher. Some traditional thatching methods used across Wales. Timber work varied depending on area and period although they would all have a base coat of organic material tied on to the whole roof of up to 9 inches thick. This would be laid over for instance twisted straw ropes stretched vertically between horizontal timbers called purling’s. Alternatively coppiced pole rafters would be used, laid closely together and again supported by periling's. Another similar version was to weave thin sticks in-between rafters of split oak, all these timber types would then be covered with a base coat of either gorse, heather, sedges, turfs or bracken and then tied down to the timbers typically with straw rope, withy bonds or bramble rope. Ancient base coats tell us so much about what crop varieties were grown, which weeds where prevalent and even what insects where about at the time the base coat was laid with some of the older smoke blackened examples surviving from medieval times providing us with an insight in to the crops and methods used in the past. 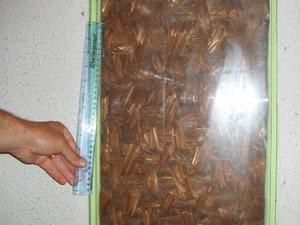 Stuff Thatching is often found in surviving historical roofs. This involves taking a hand full of thrashed straw at a time and making a twisted knot tied at the top end. The small bundle is then pushed firmly into a base coat in courses moving up the roof from the bottom in a manner where all you see is long ends exposed dangling down. These ends shed the water from the roof like thousands of little tiles. 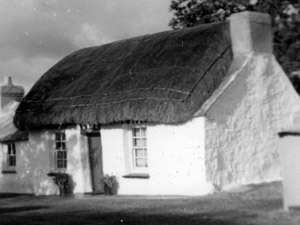 It is called stuff or thrust thatching and is still used in parts of Ireland today. 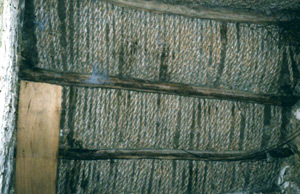 This technique was one method of many used on hay and straw ricks throughout the land and the most common type of roof covering for homes in rural Wales 150 years ago - far more common than slate. Within the south Wales area their is lots of evidence of combed wheat straw being used as long ago as three hounded years and probably much longer. 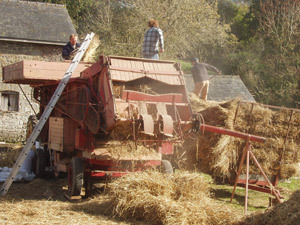 This method involves all the straws lying in the same direction and is applied with the ears facing up requiring a Leggett to dress it into position. Hazel willow or even bamboo spars fix it to a base coat similarly tied on the roof. 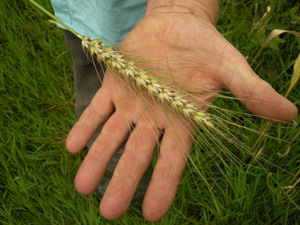 A technique that is generally a bit more craft orientated and considered to last longer. 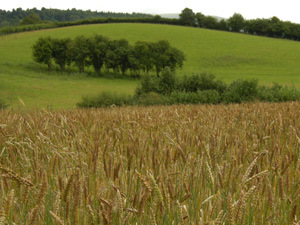 I have many case histories of rescuing old thatched roofs that so many would have written off, increasingly with historically researched and appropriate cereal crops specially grown for base coats as well as weathering coats (usually different materials and quite tricky to spot in the field for the inexperienced eye). There is haphazard and misleading technical information available to conservation officers and architects, builders and the like , this has spurned me on to provide some background information to include demonstrateable facts in order to highlight and hopefully safeguard the rich heritage slowly re-emerging back in to the welsh landscape, any correspondence and involvement would be welcome pictures/ experiences etc. please join me don’t be shy. 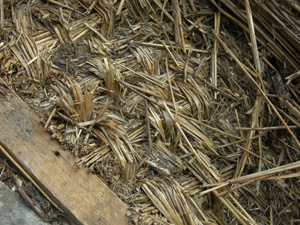 COHT* the Conservation of Historic Thatch committee from oxford of which the Prince of Wales is the patron (Dafydd and I represent this body in Wales) are hoping to keep Euro thatch to a minimum whilst protecting the disappearing unique British spar coat tradition by providing research into suitable straw varieties that will have longer lasting properties on the roof, whilst being suitable to grow in the changing climate we live in. The most durable cereal crops are the older varieties we get information and samples from the ancient base coats discovered by examining historic roofs - talk about full circle. What happens when the oil prices bite and we find we have become dependant on imported materials for a whole industry (what kind of carbon footprint is that?) and forgotten how to grow/harvest our own? Any steps taken now will put us in good stead later on. You can build a house from straw bales and thatch it with some of the same crop - there aren't many construction materials that also have a bi product of food. Please feel free to reed this article » from the 09 autumn copy of the campaign for the protection of rural Wales magazine as there are points in there pertinent to good practice as well as general interest/education. I have considerable pride in highlighting the welsh success story with finding a suitable straw variety and making it work in Wales when a lot of folk said you cannot grow wheat here let alone this variety that grows chest high. I am recognised as one of the leading conservation Thatcher’s in the uk and for my work on historical reconstruction projects but mostly for the experimental archaeology I have been involved with for so many years. Clearly the disappearance of skilled labour and appropriate construction materials are issues faced all over the uk and hard to win back requiring dedication commitment, knowledge hard work and passion.